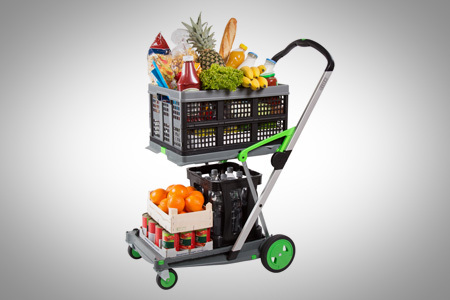 The Clax folding cart in an innovative 2 shelf compact cart. I deal for personal or business use while on the go. A simple one push button will fold up in seconds. Folded up it is easily stored or stowed away in the car. 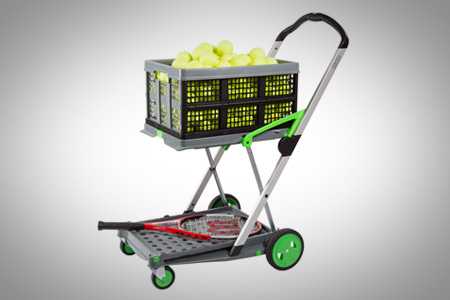 Solid construction made of aluminum and high quality synthetic materials plus a highly engineered and developed technique allow for safe and stable mobility and durability. 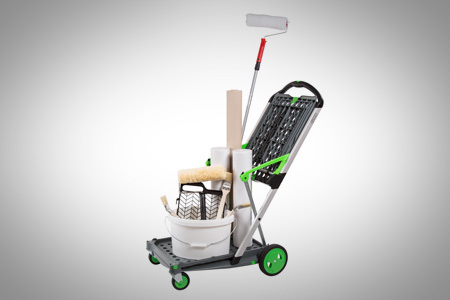 The folding Clax Cart easily and quickly collapses for storage in your vehicle while taking up minimal space. 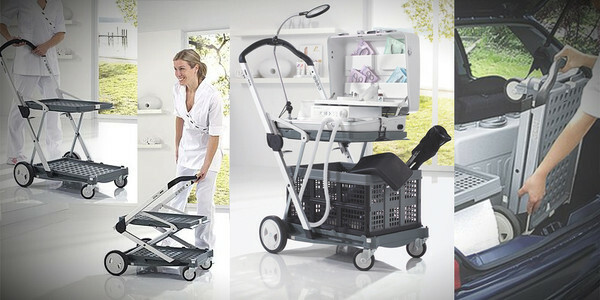 The Clax cart's ease of use and lightweight design make it perfect for a wide range of applications. 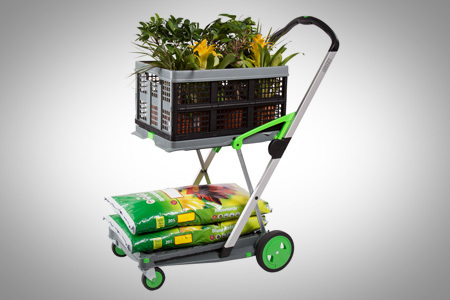 Eliminate the need for multiple trips to/from your car and no longer worry about having to carry heavy equipment! 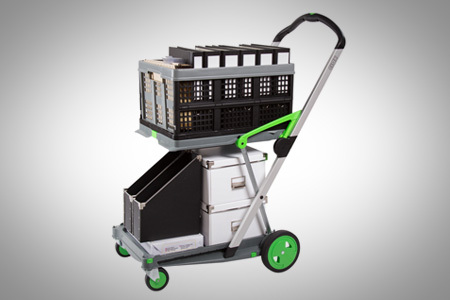 Outfit your workforce with a folding cart to assist their transportation of medical equipment, beverage equipment, restaurant & food-service equipment, computers and IT department equipment. Help sales managers deliver their equipment for an on-site demonstration or a service representative mobilize their equipment and tools for a call. Comes with one folding black carton shown in images, other items shown are only for props and are not included. 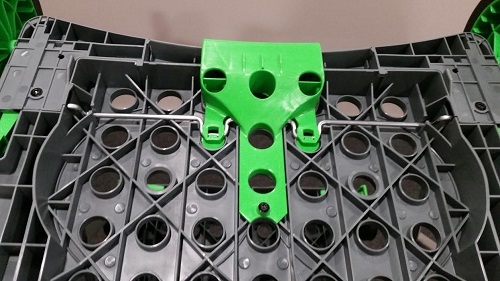 There are special built in straps on the top shelf that clip on to the folding crate when it's folded. The basket will also fit on the bottom shelf. You can purchase an additional folding crate on amazon. 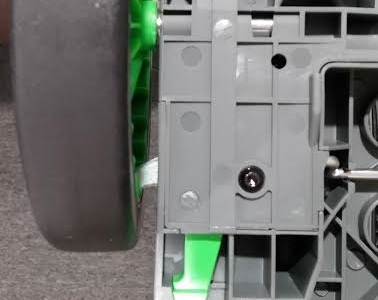 Spoke braking system, for added security. Fits into standard airline carry-on guidelines! 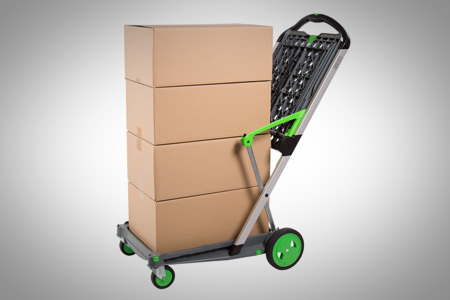 • Handler Height - 40.5"
• Wheel Width - 21.5"
absolutely love it works great for holding boxes for merchandising and I use it for a grocery cart when shopping. Disadvantages: No drink holder, I made my own and sewed it to the handle.